DOVER – DNREC Fish & Wildlife Natural Resources Police arrested a Milford woman Sunday on multiple drug-related charges at the Division of Fish & Wildlife-managed Coursey Pond Fishing Area near Felton. 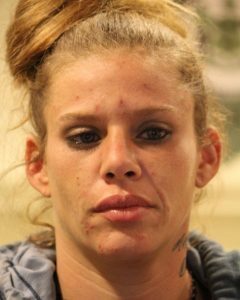 Candice N. Christensen, 32, of Milford, was charged with one count each of: possession of a controlled or counterfeit substance/cocaine, possession of drug paraphernalia not marijuana-related, and trespassing after hours on a state wildlife area. In addition, Christensen had a warrant out for her arrest by the Milford Police Department and the Justice of the Peace Court 4 on other charges. Christensen was arraigned at Justice of the Peace Court 7 in Dover and committed to Baylor Women’s Correctional Institute in Newark on a $3,000 unsecured bond. Contact: Sgt. Brooke Mitchell, Fish & Wildlife Natural Resources Police, 302-739-9086 or 302-354-1386; or Joanna Wilson, DNREC Public Affairs, 302-739-9902.